This movie uses a staple of effective scares: based on “true events.” Whether or not you believe the Lutz family’s account of what happened in the Long Island manse, it’s hard not to jump at the bumps in the night after seeing this movie. The lesson here: Never move into a house where a murder occurred, which of course seems like common sense. Based on a bestselling, allegedly nonfiction book about haunted goings-on in a Long Island house The Amityville Horror Conspiracy, this rather cheesy horror movie is more silly than unsettling. James Brolin and Margot Kidder star as newlyweds who move into the empty home and are gradually affected by the legacy of a murder committed on the premises. Rod Steiger is a priest who can tell what’s up and gets dispatched in a rather ugly way. 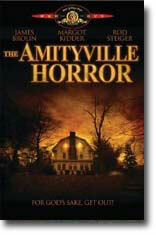 One of the most talked-about haunted-house stories of all time, The Amityville Horror hits you where you live and you may never look at your home the same way again. In the movie, the Lutz colonial home on the river’s edge seemed ideal: quaint, spacious and amazingly affordable. Of course, six brutal murders had taken place there just a year before, but houses don’t have memories…or do they? Soon the Lutz dream house becomes a hellish nightmare, as walls begin to drip blood and satanic forces threaten to destroy them. The Lutzes try to escape or forfeit their lives and their souls. Character to watch: James Brolin as George Lutz.